Known as a sparkling and magnetic western city, Las Vegas is also revered for its location. Visitors can enjoy exciting forms of entertainment in the form of gambling, shows, and dining, as well as journey to nearby natural sites that are equally impressive. 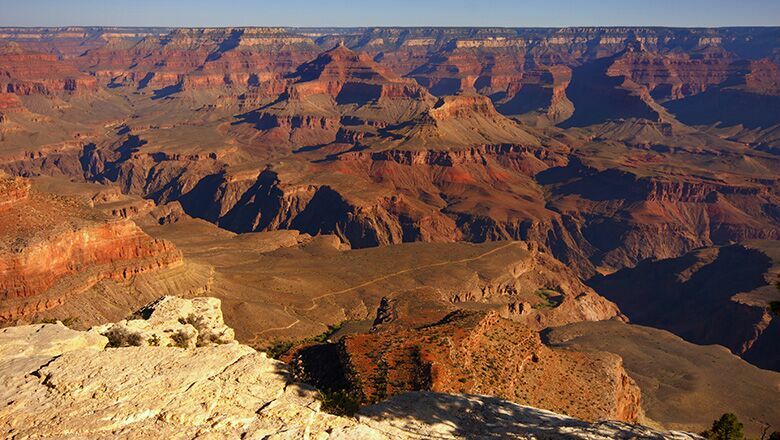 One way to complement a Vegas trip is to schedule a day trip to the famous Grand Canyon. By booking a Grand Canyon tour from Las Vegas with our tour company, Grand Canyon Destinations, you can enjoy an escape that will make your vacation a one-of-a-kind holiday. All you need to do is contact our tour service company for all the details and book a tour to the South Rim or West Rim of the Canyon. The cost of the trip is about as much as you would spend seeing a Las Vegas show or gambling. Therefore, you can allocate one day’s show money or gambling cash and take a trip to the canyon. Here, at Grand Canyon Destinations, we always provide on-time pick-up from our passengers’ hotels and timely delivery at night. Our buses feature a number of luxury amenities, including adjustable seats, individually controlled AC, panoramic window views, and an onboard restroom. Because we are family owned and operated and feature small group tours, taking a Grand Canyon tour from Las Vegas with us will make your trip both affordable and memorable. Our knowledgeable and friendly tour guides provide passenger insights and background information about the various attractions and sights. At some of the stops, they direct passengers to points that offer the best picture-taking opportunities. By taking a Grand Canyon tour from Las Vegas, you will become fully acquainted with many of the park’s natural sights and manmade marvels. Schedule a tour to the park’s South Rim or West Rim, and stop at Lake Mead and the great Hoover Dam on the way. The Skywalk, which is a cantilever glass bridge, is another attraction worth noting. Located at Eagle’s Point inside the West Rim, the horseshoe shaped projection is designed for canyon viewing. When you take a tour with Grand Canyon Destinations, you will be amazed at what you will learn and see. Why are you waiting to book a trip? Why not schedule a reservation today? There is no time like the present to plan a trip to Vegas and include a journey to the Grand Canyon on your next vacation.